What a great night! Thanks to our talented readers, to everyone who came and packed out Matt and Phred's, and to those who helped make it happen in other ways, either by blogging about it or otherwise helping us spread the love. Judges: "It seems honest, and charming. The personality of the blogger comes across well, and I like how varied it is." Judges: "Beautifully written and a pleasure on the eyes. I really like Jenn's style, sense of perspective and humour." Judges:"Very Manchester. Gives Mancubist a run for its money." Judges: "The personality really comes across, and, considering it's subject, it really isn't very 'twee' and is engaging even if you’ve never held a baby." Judges: "Blogging is about passion and information. No one could ever accuse Manchester Buses of not believing in what they write. I've also used this site to gather news!" Leave a comment with your link if you want me to add yours. And if you have photos to share, Alan at MDDA has created a Flickr group here. 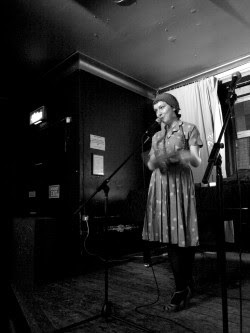 The picture above is from Sam Easterby-Smith, who has many lovely pictures of the night up on his site. Great night again Kate, congratulations! It was brilliant, just sad it seemed so short. Already looking forward to next year! Helloooo! That was good fun. Pictures pictures!